PLEASE NOTE: This is an advanced guide and requires following all the steps carefully. Should this process fail, our support will not be able to fix or repair the website for you. If you're not confident in completing this guide, you are able to purchase a migration service from us and our support team can take care of the whole migration process (click here for a guide on how to order that service). Before you begin: This guide assumes the cPanel account is new/blank and doesn't currently have any sites on it. You will need to have a backup of your WordPress files and database. They should all be added in a single file (like a .zip or tar.gz). You should also have a copy of the database file (file name ending in .sql or .zip) as a separate file. 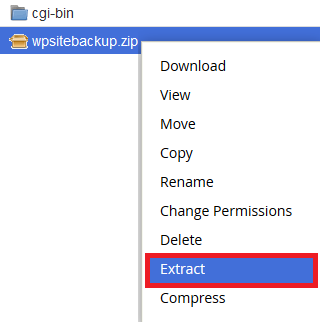 You may be able to find this by extracting your backup file. Bellow is a short list of the main fiand folders you should have. Note that your backup may contain other files and folders, that's perfectly ok. 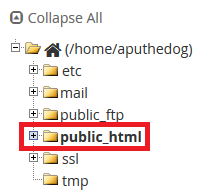 Step 5 - Keep the page with the wp-config file open. Open a new cPanel Window and use the MySQL Database Wizard to make a new database and user. Click here for a guide on how to do this. Make sure that you write down the newly created database name, username and password somewhere on your computer, like in a notepad or text document. 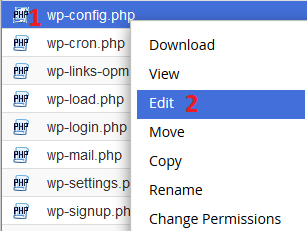 Step 6 - Go back to the wp-config.php file in Edit mode. Now you need to edit the database details. Make sure to hit Save Changes to update the new database details. Step 7 - Now you need to import the database file from your backup files onto the database you just created. Click here for our guide on importing a database using the cPanel tool PHPMyAdmin. That's all done now! If you completed all the steps correctly, the WordPress site should now be working on the new cPanel account. If your website isn't loading, the most common cause may be the PHP Version. Try a few different PHP versions. Click here for a guide on how to change the PHP version. If you have trouble after this, you may also want to update the max_input_vars to 5000 the max_input_time to 180 and max_execution_time to 180 and up the memory to 256MB or higher. Once your site is ready, you will want to make sure that WordPress and it's themes and plugins are updated to the latest version (click here for a guide) as this can improve both the speed and security of your website. Once updated, go back into cPanel and update the PHP version to a higher version and see if the site works. Newer versions of WordPress and it's themes/plugins are designed to work most efficiently with more recent versions of PHP, and older versions will run slower. If you find your WordPress website is running slowly, click here for our guide on speeding up WordPress. You might also want to set up WordPress with SSL. Click here for a guide on how to do that. Our hosting servers come with free Let's Encrypt SSL certificats, however if you want a commercial SSL certificate, click here for our guide on purchasing and setting up a Rapid SSL certificate.